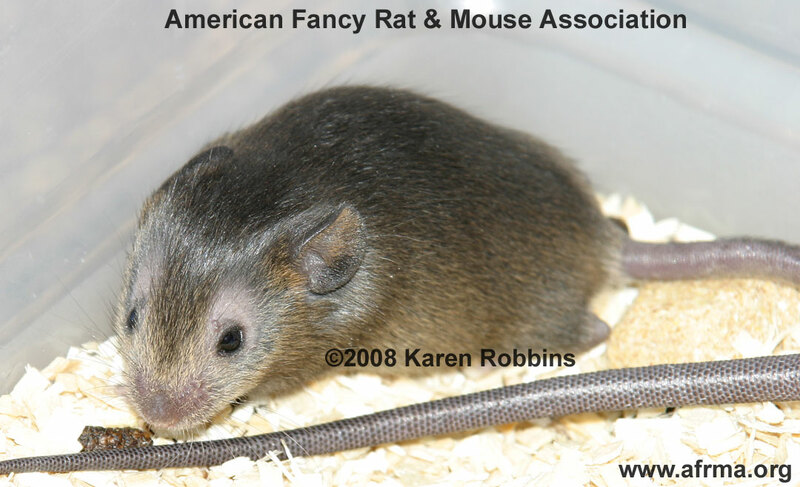 The following is a brief description of the mouse Varieties (coat types; mice do not come in breeds ) as recognized by the American Fancy Rat and Mouse Association. See Fancy Mouse Genes: Coats & Misc. for genetics. STANDARD - The coat to be smooth and glossy, and feel fine to the hand. It should show a natural high shine and densely cover the body, including the belly, groin, area around the front legs, and behind the ears. Color to conform to a recognized color or pattern. 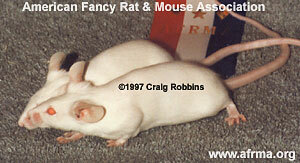 Pink-Eyed White Standard mice owned and bred by Nancy Ferris. Photo ©1997 Craig Robbins. SATIN - Satin mice may be shown in any recognized color or markings. The ideal coat has a unique and distinct appearance with its lustrous sheen. The hair should be very fine, dense, soft, and silky to the touch. 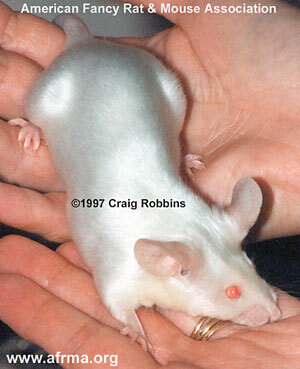 Pink-Eyed White Satin mouse owned and bred by Karen Robbins. Photo ©1997 Craig Robbins. LONG HAIR - Long Hair mice may be shown in any recognized color or markings. The coat should be as long as possible, but combined with density, and is to be fine and silky in texture. Pink-Eyed White Long Hair mouse owned by Nichole Royer. Photo ©1996 Craig Robbins. 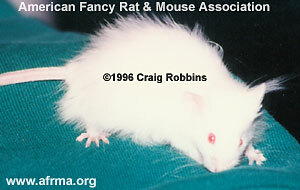 LONG HAIR SATIN - Long Hair Satin mice may be shown in any recognized color or markings. The coat should be as long as possible, but combined with density, and is to have the distinctive sheen of the satin. Blue Long Hair Satin mouse owned by Mary Sheridan. Photo ©1984 AFRMA. 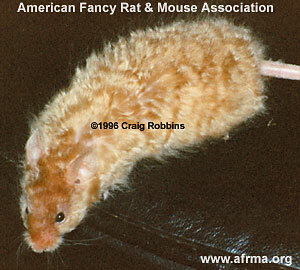 FRIZZIE - Frizzie mice may be shown in any recognized color or markings. The coat should be tightly waved or frizzed over the entire body, very dense, with guard hairs of somewhat harsh texture, protruding slightly beyond the normal length of coat. This is more pronounced in young mice, and should not influence the placement. Frizzies may also be long haired. Whiskers are to be curly. Frizzie mice are normally cobbier in body type. Black Tan Frizzie kitten mouse owned and bred by Norah Hobgood. Photo ©2009 Karen Robbins. FRIZZIE SATIN - Frizzie Satin mice may be shown in any recognized color or markings. The coat should be tightly waved or frizzed over the entire body as with the Frizzie, and should also have the distinctive satin sheen. 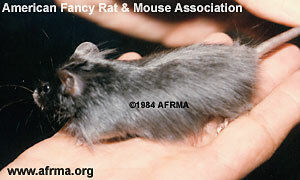 Frizzie Satin mice may also be long haired. Whiskers are to be curly. 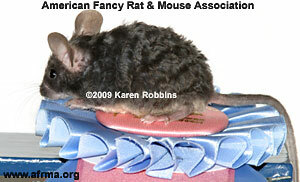 Fawn Frizzie Satin mouse owned by Michelle Collie. Photo ©1996 Craig Robbins. HAIRLESS - Hairless mice should have a thin, bright, rather translucent skin, free of scars or pimples, and be as hairless as possible. The skin may be of any color or recognized marking, and wrinkling should not be penalized. The eyes may be of any color, but should be bright and free from any problems. The ears should be very large and wrinkle free. The toenails should be short (clipped if necessary). The whiskers may be very short or missing. The Role of the Hairless (hr) Gene in the. Regulation of Hair Follicle Catagen Transformation Andrei A. Panteleyev, et al. The American Journal of Pathology, July 1999, Volume 155, Issue 1, Pages 159–171 - with diagram and photos of daily hair loss from 14–21 days old. 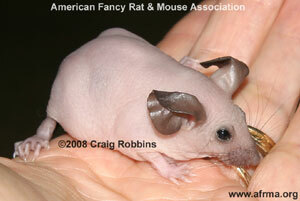 Hairless mouse owned by Meg Hurley. Photo ©2005 Karen Robbins. Agouti Hairless male 14 days old just starting to lose the hair around his eyes, owned and bred by Kelli Boka. Photo ©2008 Karen Robbins. ...and the Agouti Hairless male at 23 days old completely hairless, owned and bred by Kelli Boka. From start to finish it only takes a few days to go from haired to fully hairless. The ears do straighten out. Photo ©2008 Craig Robbins.